Welcome to the Sandy Cove Executive Home! This beautiful 4 bedroom, 3 bath home sits on 268 feet of pure sand frontage on a double, private lot. 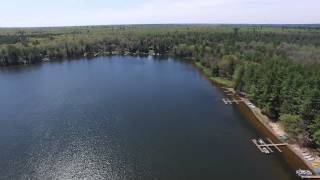 Sandy Cove is located on the south shore of Big St Germain Lake and features hard, level sand frontage that’s great for kids (and adults too)! The property provides fantastic views of the lake which is a full recreation lake with great fishing as well. Entering the home you are greeted with an open concept great room, wall of lakeside windows, stone fireplace, cathedral ceiling and tongue & groove knotty pine ceiling. The main level also has a huge wrap-around deck which allows you to enjoy the clean, pine-scented north wood’s air while you’re enjoying your morning coffee of your afternoon/evening drink! 2 bedrooms and 1 full bath complete the main level. The loft area provides unlimited views of the lake, a master bedroom and a full bath. A lower level walkout offers a family room, another large bedroom, another full bathroom, and the laundry room. There is also a 2-car detached garage. Note: The entire home is currently getting cosmetic upgrades that will be completed by March 1, 2018. You can enjoy all sorts of water recreation. Water skiing, tubing, jet skiing, fishing, boating and swimming. Something to offer in all seasons. Come up for the beautiful fall colors or snowmobiling in the winter. Don’t miss this awesome vacation opportunity! Close to the cabin is a 18 hole golf course and some of the best hiking and biking trails in the Northwoods. Did you know, St. Germain has a 45 mile trail that starts in St. Germain and takes you Manitowish Waters? 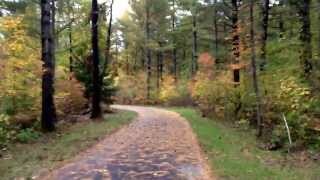 The Heart of Vilas County Trail System has some of the most scenic hiking and biking trails in the Midwest! Another unique option at “Get Lost” is to rent out fishing boats, pontoons, kayaks, paddle boards and outboard motors though Hiller’s Vacation Homes. Explore Lost Lake, Found Lake, Big St. Germain Lake, Little St. Germain Lake, and other area lakes. There are a variety of parks and beaches in the St. Germain area that have shelters, beaches, playgrounds, tennis, volleyball, basketball and baseball fields. Check out Big Arbor Vitae Park, Bond Falls, Clear Lake Park, Eagle Lake County Park, Riverview Park, Silver Lake, and the St. Germain Community Park. Other fun adventures include watching the Water Ski Shows and going on a Northwoods Zip Line Tour. Fishing on Lost Lake is excellent. Get ready to reel in Musky, Walleye, Perch, Northern Pike, etc. There are guided fishing trip options in the area as well. Through Hiller Vacation Homes, you can rent out pontoon boats, kayaks, paddle boards, fishing boats and outboard motor. Also close to hundreds of miles of groomed snowmobile trails, cross country skiing trails, and snowshoeing trails. Are you ready for the full cabin experience at “Get Lost”? *Rates provided do not include taxes and other applicable fees. Rates are subject to change.